New research is hoping to understand how the human brain hears sound to help develop improved hearing aids and automatic speech recognition systems. Led by the Universities of Southampton and Cambridge, the research aims to develop physiologically-inspired algorithms, which mimic how our brain hears sound to improve on traditional signal processing algorithms. The novelty of the research is that instead of looking at signal energy – as today’s artificial devices do – the researchers are concentrating on how the brain processes sound information instead. Dr Stefan Bleeck, from the Institute of Sound and Vibration Research at the University of Southampton, is looking to create algorithms based on neuronal responses to give insights into how sound is coded within the brain. Once researchers know better how sound is coded, they will be able to select the parts that code speech and the ones that code unwanted noise. They will then be able to resynthesize sound in hearing aids with reduced noise, but with quality intact, to enhance speech intelligibility. Today’s speech enhancement systems can reduce noise and increase speech quality, but they are not good at improving speech intelligibility, especially in noisy situations where users have to concentrate to pick out single speakers. With about 10 per cent of the UK population hearing impaired, current signal processing technology hasn’t come up with a suitable system to enhance speech intelligibility. Dr Bleeck says: “Today, it is still the ultimate goal for the speech signal processing community to develop speech enhancement systems that perform as well as humans in noisy situations. 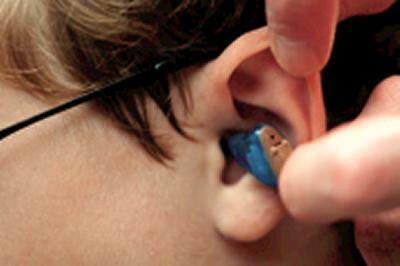 Normal hearing humans still easily outperform any technical system – sound processing in the brain is more successful than signal processing in silicone. A system that works as well as a human would lead to the next revolution in human communication and would greatly benefit hearing impaired people. Dr Bleeck has received funding from a Google Research Award to undertake this research with ISVR colleague Dr Matthew Wright, and Dr Ian Winter of the University of Cambridge's Department of Physiology.